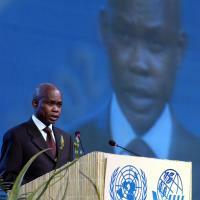 Agba Otikpo Mézodé is a former politician and diplomat from the Central African Republic. Otikpo Mézodé was named foreign minister of his country on 5 April 2001 in Martin Ziguélé government alongside finance minister Eric Sorongopé and Interior Minister Théodore Bikoo. He left office in 2003.